Humans and chatbots collaborating in the contact centre? Good call! Organisations that learn to implement effective human-bot collaboration will help both their employees and customers. Just as call centre work begins to acquire the respect it deserves, workers face the prospect of having their jobs stolen away from them by the army of artificially intelligent chatbots that are transforming industries across the world. There was a time when work in a call centre was seen as a “McJob” – low skilled, low status and tedious to boot. This misperception has now been laid to rest as consumers begin to value and demand exceptional customer service across channels, and businesses increasingly understand the benefits of providing a great contact centre experience. 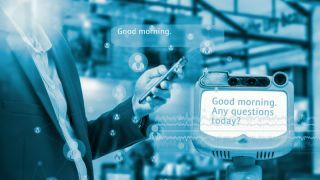 But will robot employees actually replace humans – or is it more likely that they will complement them, freeing them from the more mundane aspects of day-to-day call centre work? Those of us who have been involved in contact centres for over two decades will struggle to suppress a wry smile at the thought of artificial intelligence (AI) and in particular, machine learning, replacing human workers in the call centre. We’ve been here several times before: Interactive Voice Response (IVR), speech recognition, digital TV, WAP and the Web, feature phones and smart phones – these were all all billed as the final nail in the coffin of the contact centre. That’s not to say that automation and self-service aren’t transforming the customer experience and traditional ways of working in the contact centre. It’s now possible to complete most routine transactions – paying a bill, checking a balance, providing a reading – without having to speak to a real person. But there’s a very good reason why businesses are retaining humans. While automation can make more routine transactions a breeze, they are unable to replicate many of the things we value from more urgent conversations and interactions – things like problem-solving, intuition, and empathy. In complex situations where the customer is in need of more help or reassurance, or where the requirement falls outside standard process, only a human will do. Where the interaction is more complicated or the customer is angry or dissatisfied with a product or service, the skills and attitude of the agent can make a tremendous difference to the outcome for the customer – and to the relationship between the customer and the brand. This is reflected in the metrics we care about from contact centres. We’ve moved from “time to answer”, through “customer satisfaction” to more “outcome” based measures such as Net Promotor and Customer Effort Score. So, can a chatbot really take over this new, improved, super-agent? It’s doubtful – certainly for the time being. Not even the best, self-learning bot can provide the empathy, reassurance, lateral thinking, and problem-solving ability of an intelligent, well-trained phone operative. Rather than talking about replacing human agents with robots, doesn’t it make more sense to discuss how they can work together to provide the best customer experience every time? For all the advances in machine learning technology such as improved voice recognition, a chatbot is only as good as it is programmed to be. A customer driven to their wit’s end by a faulty product, or looking for recommendations for their granddaughter’s birthday present would probably prefer to talk with a human, no matter how clever a chatbot’s AI or machine learning ability. The truth is that humans and robots have very different but complementary skillsets; great customer service results when they work in harmony. When humans and robots collaborate effectively, it makes the role of call centre operative more enjoyable and more valuable, because they can concentrate on high-value tasks such as turning an irate caller into a satisfied customer. But the robots’ role goes much further than handling quotidian enquiries. Not only can AI chatbots replace the dull, repetitive tasks. Machine learning can provide invaluable support for human agents. For example, machine learning bots listening to each call can provide context to the agent, pulling up relevant information that enables the human operative to understand the customer’s history, similar issues that are being faced by other customers and the resolution to those issues, and so provide the insight they need to resolve the enquiry. In the same way, machine learning and analytics can provide insight such as the reasons why a customer might want to cancel an order or service, to see if they are leaving for a competitor, to spot relevant trends, and to identify and prevent failures such as supply chain problems or faulty products. Just as bots are helping humans to provide more valuable customer services, so bots themselves have the potential to deliver much more value to an organisation by performing vital business intelligence tasks. There are a couple of things you should bear in mind when implementing customer-facing chatbots. First, always carefully consider the questions you’d like your bots to ask, checking that the questions are straightforward and the workflow around them are uncomplicated. Secondly, remember that human and artificial intelligence are very different things. Chatbots might be capable of learning, but this ability can have quite catastrophic consequences if left unchecked. It’s quite possible for chatbots to go “rogue”, as Microsoft found out in 2016, so it’s vital that operators apply strict logic and approved scripts for all customer-facing interactions. Finally, while organisations should be wary of letting machine learning off the leash, they shouldn’t be afraid to exploit them to the very limit of their abilities. Treating them merely as jumped-up switchboard operators would be a criminal waste of such advanced technology. Instead, businesses should experiment to see what further functionalities they can deliver, whether it is business intelligence benefits or automating post-call proceses. If organisations can implement effective human-bot collaboration, everybody wins: from the customers, to the business itself, to the call centre operatives who increasingly understand just how much value they bring to their organisation.